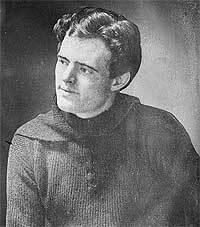 "The People of the Abyss" by Jack London is a book in the Non Fiction genre, first published 1903. Notes: Jack London's first-hand account of life in London's East End at the turn of the twentieth century. Born on 12th January 1876, John Chaney had a disturbed early family life, eventually taking the surname of his stepfather when his mother re-married, and going by the nickname Jack, resulting in the name he would publish under. Writing fiction and non-fiction, he was a journalist, war correspondent, and novelist. He was also politically active, a firm believer in socialism, and campaigned against animal cruelty, all of which are topics that feature strongly in his work. He died on 22nd November 1916 on his ranch in California, where his ashes were buried.